Last week I shared a big reason to eat more chillies. If you missed my post here’s the reason – chillies could add years to our lives. Researchers at the University of Vermont studying almost 17,000 Americans over 6 years found a significant reduction in deaths among those with a fondness for spicy chillies. Now, knowing chillies can play a role in helping us to live longer, I’m an even bigger fan. 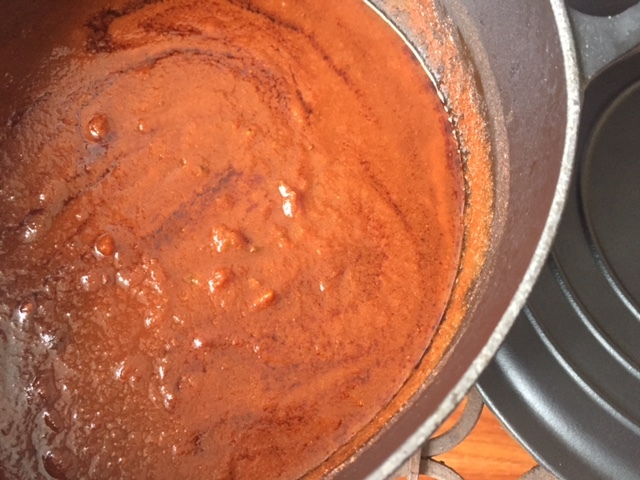 So here I’m sharing with you a chilli and flavour packed Mexican sauce. This sauce was the result of my first experiment with the dried chillies I covered in last week’s guide to Mexican chillies. It’s a sauce that would pair well with all types of legumes, beans, vegetables, and of course with meat. I added black beans and corn kernels to my first batch and next time I’m going to try kidney beans and red capsicum. 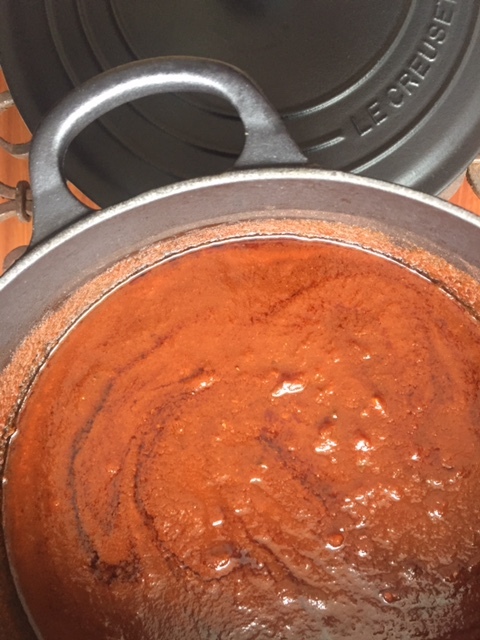 I’ve called this my Mexican ‘mole’ sauce because ‘mole’ is the general term used for a whole range of sauces in Mexican cooking. They’re usually made up of many ingredients, including of course chillies. I felt this was the perfect recipe to share for Fiesta Friday #161 – especially because I’m co-hosting this week’s party. Fiesta Friday is a weekly gathering of wonderful cuisines from all over the world – it’s a welcoming foodie community, a place to share recipes and a place be inspired by others. I’d love you to join in by linking your posts to Fiesta Friday and to my Feast Wisely blog. And don’t forget to tag ‘Fiesta Friday’. (You can check out the guidelines here). My recipe here was heavily inspired by one from Hank Shaw – a food writer with a passion for honest food and a blog with the same name – Honest Food. Hank talks about following the road less traveled – in the sense of using vegetables and meats that we don’t seem to eat anymore. It was his post for venison chilli recipe with Mexican dried chillies that caught my eye. I guess you could say for many of us, myself included, dried Mexican chillies are on the road less traveled. Although guided by Hank’s recipe what you see here is my vegetarian and vegan version. I omitted the animal ingredients and the fructose/sugar from the molasses, added dried oregano and tomatoes and adapted the chillies to use those I had in stock. My recipe uses four types of dried chillies. Three of these – ancho, mulato and pasilla, make up what’s called the ‘holy trinity’ of chillies in Mexico’s national dish, mole poblano. To find out more about the chillies in this recipe check out my guide to dried Mexican chillies. These quantities make enough sauce for 6-8 people. I used some right away and froze two portions for later. Put the chilli chunks in a bowl, just cover with boiling water and leave to stand for 30-60 minutes. Add the 250ml each water and coffee to the chilli mixture and using a blender blitz it into a smooth paste. Heat a large saucepan and once hot add the coconut oil and then the diced onion. When the onion is soft add the crushed garlic, followed by the spices and herbs. Add the salt and the tomatoes, followed by the chilli paste. Bring to a simmer and transfer covered to the oven. Cook at 150C for 3 hours or until the sauce has reduced. Of course if you’re adding legumes, vegetables or meat that have a cooking time of longer than 15 minutes I’d recommend adding them towards the end of the 3 hour cooking time. Otherwise, if like I did, you’re using quick cooking fillings (like canned kidney beans or corn kernels) then you can remove the sauce from the oven and gently re-heat with the fillings on a low simmer. Thanks for reading and happy Fiesta Friday everyone! Remember to join the party simply link your posts to Fiesta Friday and Feast Wisely. And don’t forget to tag ‘Fiesta Friday’. Tags: chilli, chillies, Fiesta Friday, Mexican, Mole, recipe, sauce. Bookmark the permalink. Laura, I love this recipe! I use chillies liberally in my cooking and I am a huge fan of slow cooking in the oven. Plus I’m addicted to Mexican. Are you sure you didn’t write this recipe for me?? That’s so good to hear Tracey – it seems we have a lot in common and I do hope you give this recipe a go! Don’t get too caught up on the exact type of chillies because I think you could experiment. This looks delicious! I’ve pinned it for when I get around to purchasing some chillies. Thanks Liz – it’s really versatile and the dried chillies make such a huge difference…. Love it! I make so many Mexican chilli sauces, I love them. I’ve never added coffee though, I don’t actually like coffee, do you taste it in the sauce? I know I can get three of the chilies – will have to probably shop on Amazon or sub a different chili for the mulato. Love Mexican food but I just don’t cook it enough even though I have a couple of good cookbooks. Sounds good but you could I think sub the mulato for another type or an extra one of the other three – and yes I’m a big Mexican fan too and this sauce is great because you could add pretty much anything to it! This sounds like a wonderful sauce! Thanks Nancy – glad you like it! 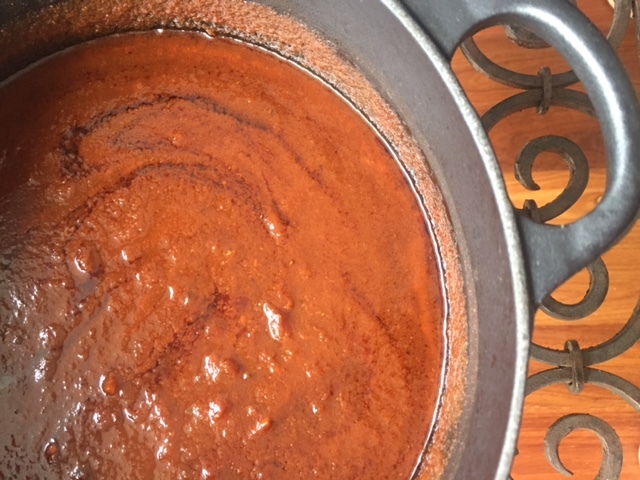 We just got back from Arizona, and I just loved the mole sauce. Thank you for sharing this one and hosting this week! Thanks Julie and lucky you – I’d love to try mole made by expert hands! That is one loaded chili sauce. Thank you for this informative post, I did not know there were so many different kinds of chillies; and for hosting the FF party! Thanks for stoping by and yes it’s chilli loaded but the end flavour isn’t overly spicy – this mix of chillies seems to add more depth of flavour than pure heat! 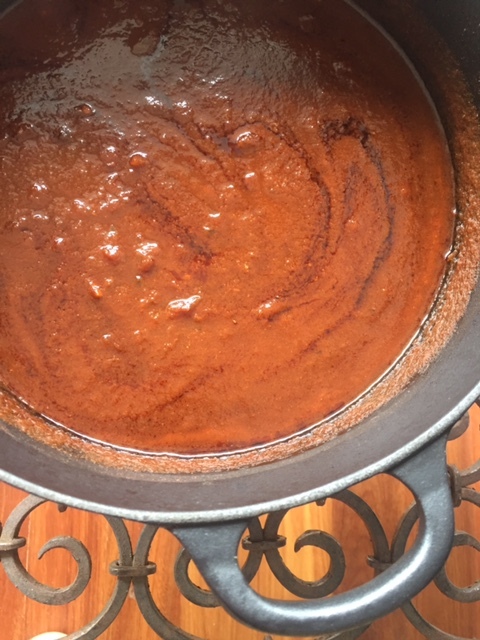 Thanks Angie – I’m intrigued and would love to see your mole recipe…..
It’s pretty tasty but my favorite version has more spices. I’ll have to post it one of these days. What a flavour-packed sauce! I just want to drizzle it over a big bowl of rice and beans and eat the lot! That colour is magnificent.